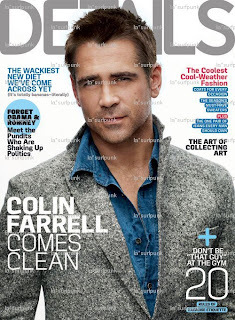 A gorgeous Colin Farrell covers the new DETAILS magazine. The long-in-the-tooth lad FINALLY grows up and reigns in all the drinking and the notorious debauchery!!! Honestly. I’ve got eight hours a day now that I didn’t have before, when I was drinking every day for 18 years. Oh, I wouldn’t tell a truth all day,” he says flatly. “If I’d had chicken and beans for dinner, I’d tell you I had steak and potatoes. No purpose, just habit. The amount of energy you have to put in and the amount of lies you have to tell to keep a drug habit alive, it’s fairly significant. Your whole life is a lie.